The first documented passport wasn’t quite a passport at all, but a letter from the Persian king Artaxerxes requesting safe passage for a court official around 450 BCE. Through the mid-1500s, the passe porte allowed European travelers passage through the city gates (called portes). The first US passe-port was written by Benjamin Franklin and printed on his own press. Here in the 21st century, the passport has evolved to not only act as the key to get through (airport) gates, but it has become a symbol of our ability to travel freely throughout much of the modern world. Well, perhaps not quite freely. The average flight from the US to Europe ranges from $788 to $1,435 — per person — depending on where you fly out from, and that doesn’t touch meals and lodging. That’s where travel rewards credit cards come in; you can turn your rewards into free flights, hotel stays, and other key travel expenses, allowing you to put that passport to good use. Few things in life are quite as frustrating as saving and planning for the perfect trip — only to have everything go sideways when it’s time to book. Welcome to the roadblock that is travel rewards blackout dates. Add in airline or hotel brand restrictions, and successfully organizing your points or miles vacation can start to feel like wandering through a maze with nothing but dead ends. Thankfully, a number of great travel rewards credit cards offer points or miles without the strings and limitations of blackout dates and brand restrictions. Instead of planning your trip around your points, the rewards you earn can be redeemed for travel expenses regardless of where or when — or with whom — you travel. 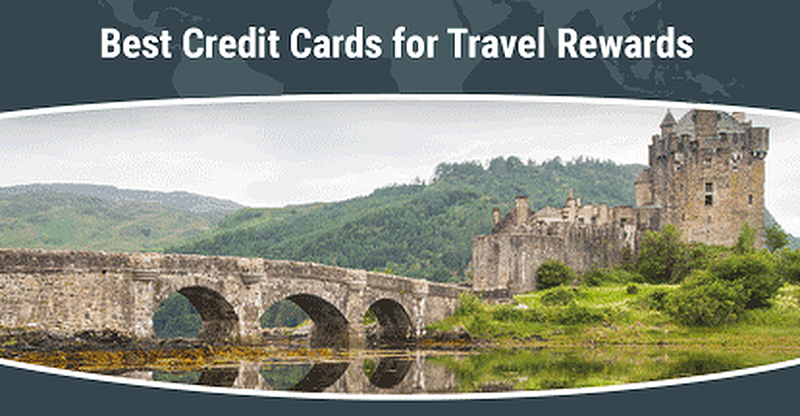 Plus, pay no foreign transaction fees with many of our favorite flexible travel rewards cards. If you do have a specific travel brand you prefer, you can still win with flexible travel rewards credit cards. Besides redeeming your points or miles for travel credit, some programs also allow you to transfer your rewards to a partner airline or hotel loyalty program. This can turn your flexible rewards into branded points or miles that can be combined with your existing frequent flyer miles or hotel loyalty points. Depending on how much you spend each year, it can be easy to earn enough rewards and rebates to more than offset any annual fee, even on cards with triple-digit annual fees. Likewise, if you place a lot of value on certain perks and benefits that often accompany high annual fees — particularly when it comes to travel cards — then those fees may be worth paying for you. For others, however, annual fees are simply nuisance expenses that detract from the value of the rewards — and the card. Luckily for them, the rewards credit card marketplace is thick with no-annual-fee card options, including a wide variety offering solid travel rewards. What’s more, our top-rated picks for travel cards without annual fees also won’t charge you foreign transaction fees for purchases in another currency. 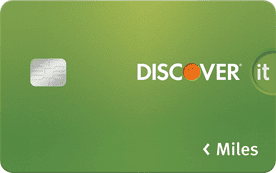 The Discover it® Miles card has a unique signup bonus that matches the miles you earn during your first year on your account anniversary. Capital One was one of the first issuers to offer blackout-free travel rewards, and its travel cards are still among the top flexible travel rewards options. The Bank of America® Travel Rewards Credit Card allows cardholders to earn unlimited rewards points that can be redeemed for blackout-free flights, hotels, vacation packages, rental cars, or baggage fees. The Bank of America® Travel Rewards Credit Card also offers bonus points for Bank of America customers who have an active checking or savings account, with Bank of America Preferred Rewards clients earning the most bonus points. One thing to keep in mind is that “no annual fees” doesn’t mean “no fees at all.” Unless you have an introductory 0% APR offer active on your card, you’ll be charged interest fees on any credit card balances you carry from month to month. These fees can easily overwhelm any purchase rewards you earn, as well as eliminating the savings from not paying an annual fee. While having the flexibility to redeem your travel rewards can make planning your next trip significantly easier, credit cards co-branded with specific airlines can frequently offer exclusive perks and benefits that may offset the limitations for some applicants. These benefits can include cost-saving perks, such as free checked bags, as well as luxuries like airport lounge access. And co-branded credit cards can be especially appealing to cardholders who have a particular affinity for a specific airline and want a faster way to accrue frequent flyers miles, as these cards typically reward you with miles for every purchase. The cards on our list also offer bonus frequent flyer miles — at least 2X per $1 — for qualifying airline purchases. Earn unlimited frequent flyer miles with the Gold Delta SkyMiles® Credit Card from American Express, plus enjoy special cardholder perks like priority boarding and a free checked bag. As an added perk, the Gold Delta SkyMiles® Card doesn’t charge foreign transaction fees, freeing you up to purchase like a local when you travel. With domestic trips starting at just 7,500 miles, the Citi® / AAdvantage® Platinum Select® World Elite™ Mastercard® offers cardholders an easy way to earn free travel. Additionally, redeeming your points can earn you more points, as you’ll receive bonus miles equal to 10% of your redeemed miles. Servicing more than 180 destinations globally, the British Airways Visa Signature® Card can get you to many of the most popular travel spots around the world. The cost of rewards flights are based on the distance you fly, with short-distance trips (650 miles or less) starting at 4,000 Avios miles for off-peak travel dates. Even if you choose to go with a co-branded airline travel rewards credit card, you likely won’t be limited to a single airline. Most major airlines are part of an airline alliance that partners them with other airlines, some alliances holding up to 27 members. Many frequent flyer programs allow you to transfer rewards between alliance airlines and/or redeem your rewards for flights on other airlines in the alliance. Similar to co-branded airline credit cards, travel rewards cards co-branded with a hotel loyalty program typically offer cardholders a quick way to earn hotel loyalty program points. Most co-branded hotel cards not only provide at least one point per dollar for all of your card purchases, but most also allow you to earn bonus points — at least 2X per $1 — for hotel stays and on-property purchases. Additionally, hotel-branded travel rewards credit cards frequently provide a range of freebies and perks, including complimentary elite status, free internet access, and no-cost room upgrades that can make your stay more comfortable and more affordable. The hotel brands on our list include global options with thousands of properties from which to choose. 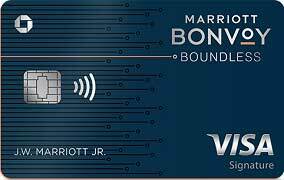 The Marriott Bonvoy Boundless Card is the new mid-tier card that resulted from the rebranding of the Marriott and Starwood programs after their merger. The card offers six points per dollar on Marriott purchase and two points on everything else. Cardholders receive automatic Silver Elite Status with Marriott Bonvoy and can earn Gold Status by spending $35,000 on purchases each account year. Users can also enjoy free premium in-room wifi and an annual free night award after the account anniversary. The Hilton Honors Ascend Card is not only a quick route to free stays with its double-digit rewards rate for Hilton purchases, but also provides you with complimentary Hilton Honors Gold status. The Hilton Honors Ascend Card is also great for big buyers, as you can earn a free Weekend Night Reward when you spend at least $15,000 on your card in a single calendar year. 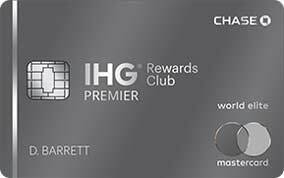 The IHG® Rewards Club Premier Credit Card offers all the usual perks of a mid-tier co-branded hotel card, including a high rewards rate for branded purchases and complimentary Platinum Elite status. This card also offers a number of other money-saving perks, like a free anniversary night each cardmember year and your fourth reward night free on rewards point stays of four nights or more. The same way other travel rewards programs often allow you to transfer points and miles, so, too, will many hotel loyalty programs allow you to transfer points to partnering hotels and airlines. In some ways, the always-on-the-go businessperson who practically lives in the air or on the road has become a cultural cliche — but that doesn’t make it any less a reality for many people. For these frequent travelers, a quality travel rewards business credit card is nearly a necessity, offering not only a way to save on trips but also providing a host of perks that can make those trips much more pleasant. But even if your business requires a little less roaming, you can still use a travel rewards business card to earn points or miles on your business purchases — rewards that can reward you with free travel when the work is done. Business travel cards, including our picks below, offer most (if not all) of the benefits of their consumer counterparts, as well as providing extended benefits for business customers. Beyond being a solid travel rewards option for small business owners, the Capital One® Spark® Classic for Business is one of the few business cards available to those with average credit. With a CitiBusiness American Airlines credit card, you can experience all the perks of the consumer card, plus earn extra rewards on card purchases in common business categories. Spend at least $30,000 on your CitiBusiness American Airlines in a single calendar year and you’ll unlock an American Airlines Companion Certificate that allows a friend or coworker to travel with you for only $99 (plus fees). 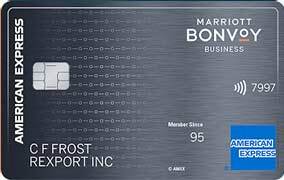 The Marriott Bonvoy Business American Express® Card is the business credit card for the newly rebranded Marriott Bonvoy program. The card offers 6X Marriott Bonvoy points per dollar at participating properties, plus four points per dollar at U.S. restaurants and gas stations, and on wireless services purchased from U.S. providers. Your new business credit card can also have another benefit that has nothing to do with hotels or airlines: building business credit. Your business can — and should — build its own credit history separate from your personal credit. As you responsibly use your card to earn rewards, you’ll also be building a credit history that can help unlock other types of business financing in the future. The US passport started from humble origins, hot from Ben Franklin’s printing press and hand-delivered to its recipient. Today, more than 136 million US passports are in circulation, meaning 1 in every 2.4 Americans has a valid US passport. Sadly, those passports do many of us little good sitting in a desk drawer or safety deposit box, waiting for the day we can afford that trip of our dreams. Travel rewards credit cards can be a simple, convenient way to make the purchases you were going to make anyway, all while earning points or miles you can redeem to cover a wide variety of travel expenses — and a reason to pull that passport out of hibernation.